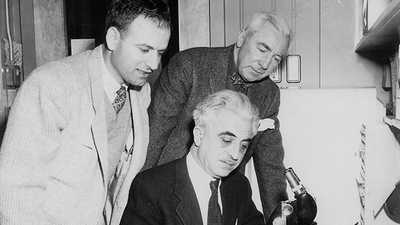 The first prescription drug for healthy patients, the Pill neither treated nor prevented disease. Instead, taken daily, it prevented pregnancy by changing the hormonal balance in women's bodies. The Pill far surpassed other contraceptive methods, except abstinence, in effectiveness. All a woman had to do was remember to take it every day. Pill packages quickly evolved to remind women to take their daily doses. Browse samples of Pill package design in this gallery, featuring historical images from the Smithsonian's National Museum of American History. In 1962, Illinois engineer David P. Wagner made a prototype pill dispenser, three round plastic plates held by a snap fastener. It was the first to organize a monthly pill supply into daily doses. The bottom plate has the day-of-the-week pattern. 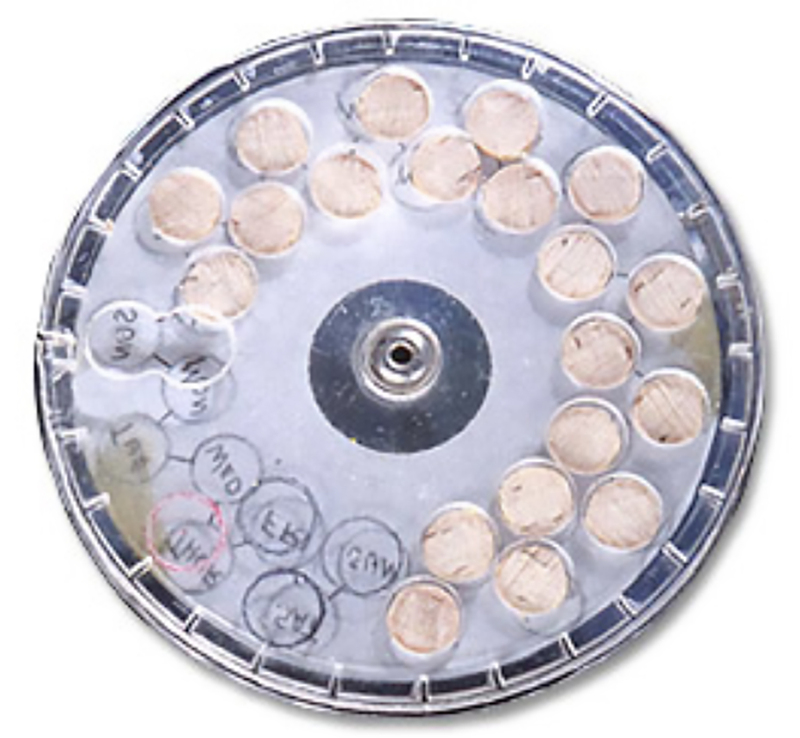 The middle plate holds twenty wooden "pills" and rotates to match the day pill taking begins. 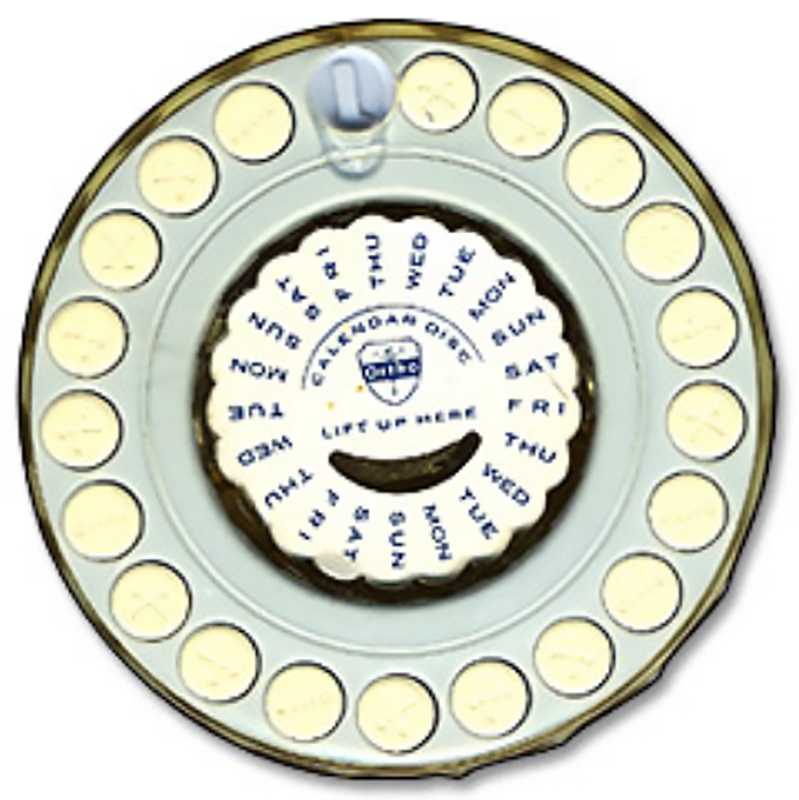 A single hole in the top plate moves over the pill to dispense it, revealing the day of the week as a reminder that the pill was taken. 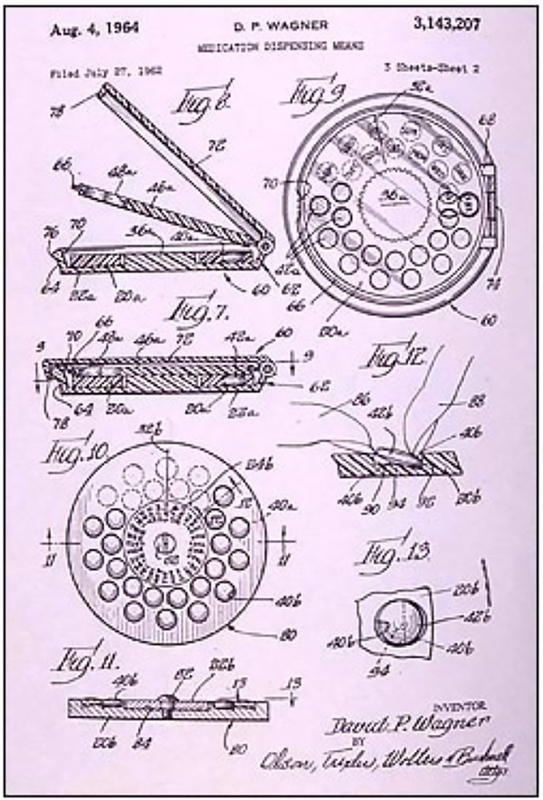 David P. Wagner won U.S. patent number 3,143,207 for the first oral contraceptive pill dispenser. He designed the dispenser to be the size of a makeup compact, so women could carry it discreetly in their purses. 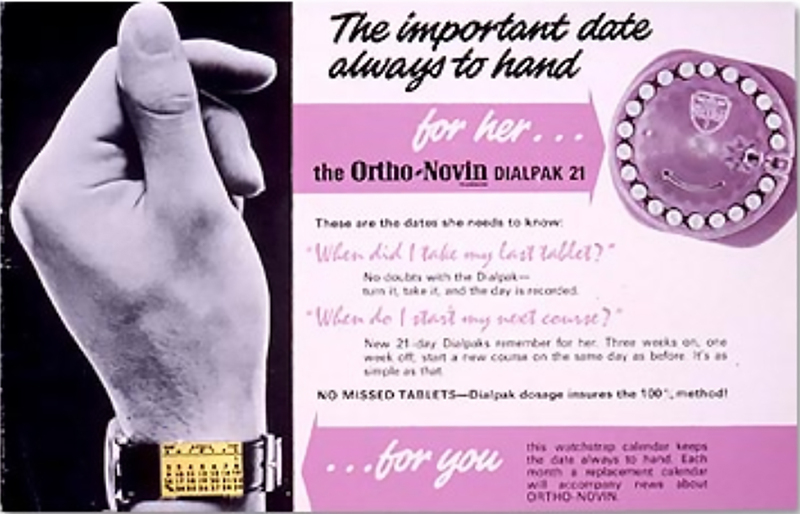 Ortho-Novum, 10 mg, became the second oral contraceptive on the American market on February 1, 1963. The Dialpak was the first compliance dispenser for a prescription drug, designed to help women remember to take the pill. 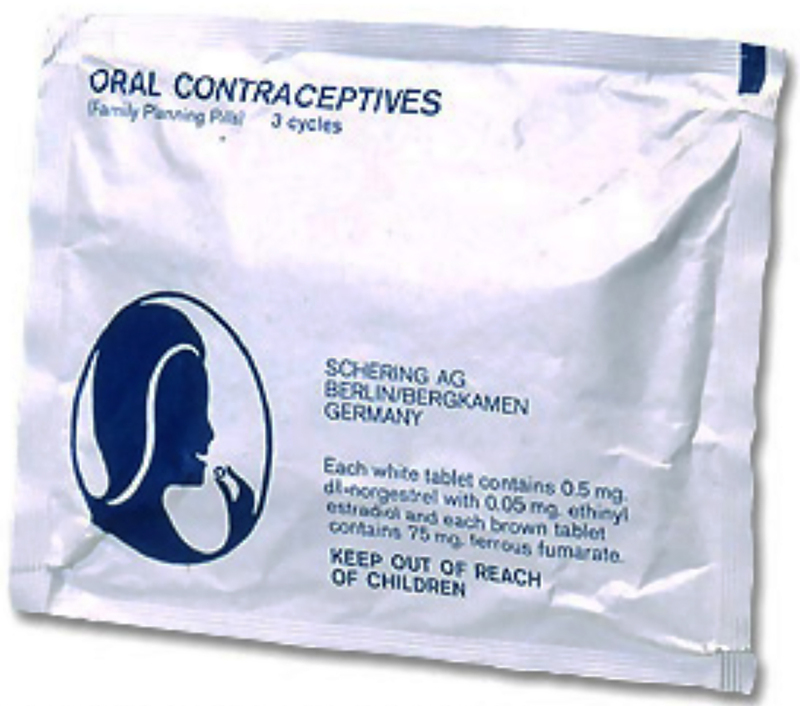 After the Dialpak, all oral contraceptives would be packaged in memory-aid dispensers. Ortho focused its advertising on the Dialpak to distinguish itself from the competition. This advertisement for the Ortho-Novum Dialpak 21 highlights a watchstrap calendar that keeps key dates "always to hand." 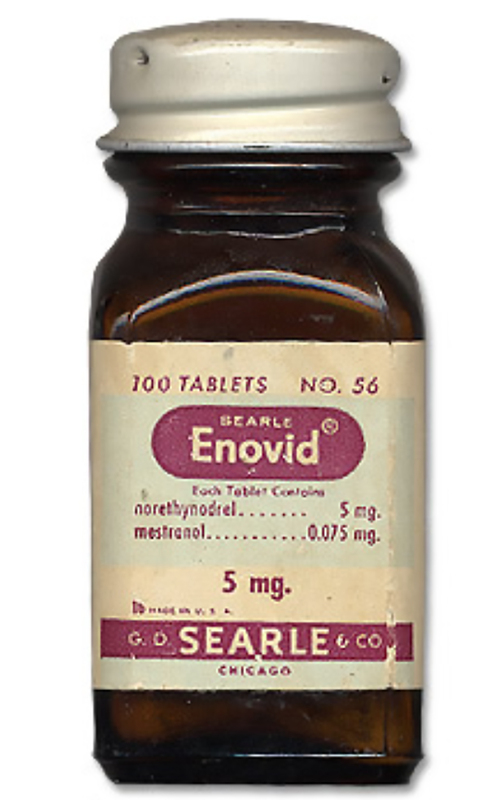 G. D. Searle's Con-pac tablet dispenser held 20 tablets of 2.5mg Enovid-E pills. 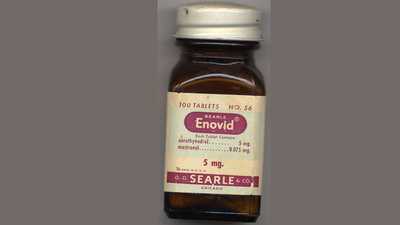 By the time a 1mg Enovid-E pill came into the market, in 1966, the dispenser had been redesigned with no moving parts, to make it error-proof and jam-proof. Eli Lilly introduced c-Quens, the first sequential oral contraceptive in the United States, in 1965. It contained two different formulations to be taken in sequence. The package superficially resembled a calendar, with four rows of five tablets. Other than a place to note the date on which the first pill was taken, it offered little help to determine if one missed a day. Syntex, Inc. sold Norinyl in a Memorette package, an example of a calendar memory package. 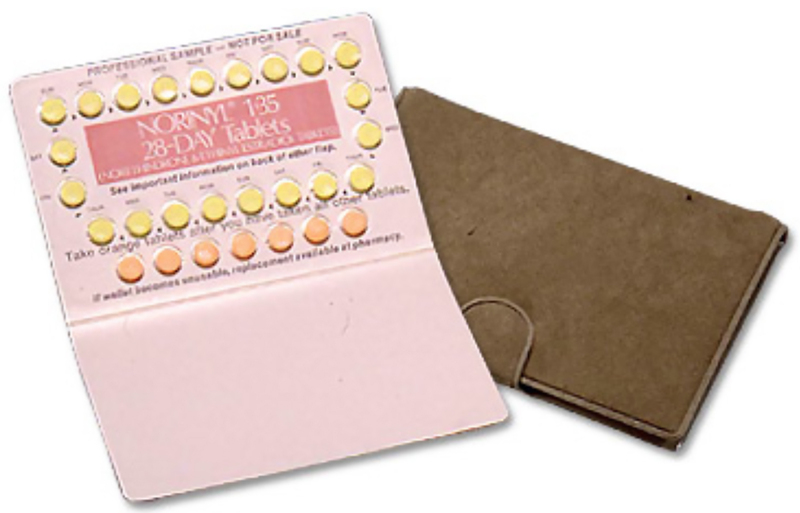 An extra tablet was added to the original twenty-pill cycle to provide one oral contraceptive pill a day for three weeks. A fourth week of inert pills was added on the premise that it is easier to remember to take a pill every day rather than to spend three weeks on the pill and one week off. 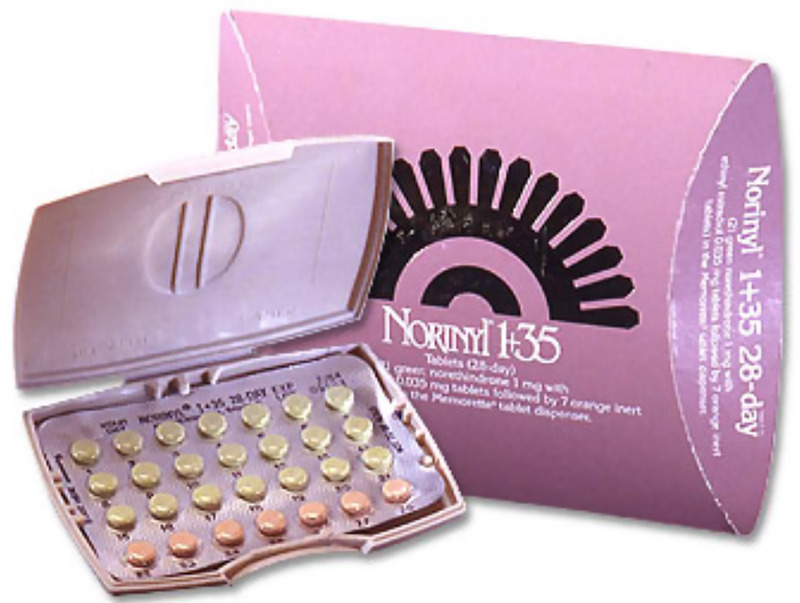 Syntex, Inc. also provided Norinyl in a Wallette package, which placed 21 oral contraceptive pills in a "racetrack" design to insure that pills were taken in the correct order. Below the racetrack was a row of seven inert pills so women could take a pill every day, making it easier to remember. In 1967, the U.S. Agency for International Development began purchasing oral contraceptives for distribution to international family planning agencies. All distributed pill packages were adorned with the "Blue Lady" image. 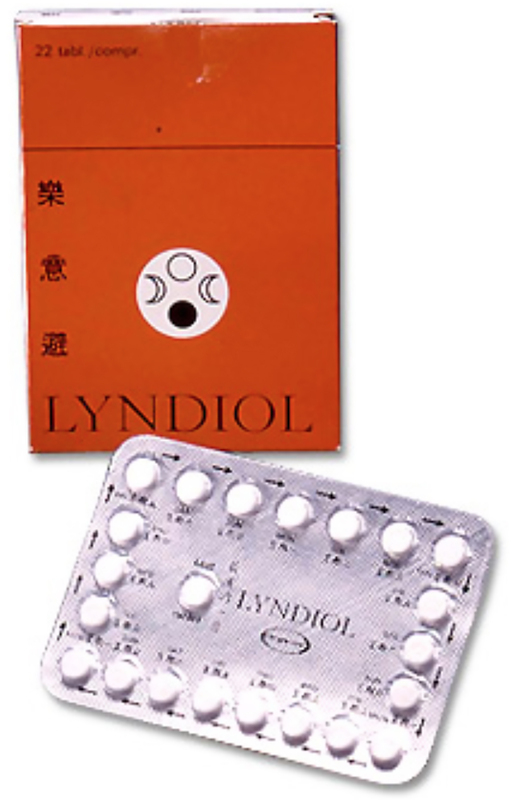 In 1962, Organon Laboratories in Holland developed Lyndiol, a birth control pill administered on a 22-tablet regimen. Unlike the "three weeks on, one week off" system, Organon reasoned that "maximum patient reliability" was achieved when each new cycle of tablets began and ended on the same day of the week. If the last tablet was taken on a Friday, the first tablet from the next package would be taken the next Friday. In 1981, Wyeth Laboratories, Inc. was packaging its Ovral-21 in a "racetrack" package adorned with a butterfly and flowers. The tablets came in foil inserts that were replaced each month. The patient package insert is shown with the cover. It provides information on how to take oral contraceptives and lists potential side effects. Berlex Laboratories, Inc. packaged its sequential Tri-Levlen 28 pill in three different doses and hormone combinations, to more closely mimic a woman's menstrual cycle. Each type of pill was a different color and had to be taken in sequence as the arrows on the package directed. This 1988 package features a sliding cover. 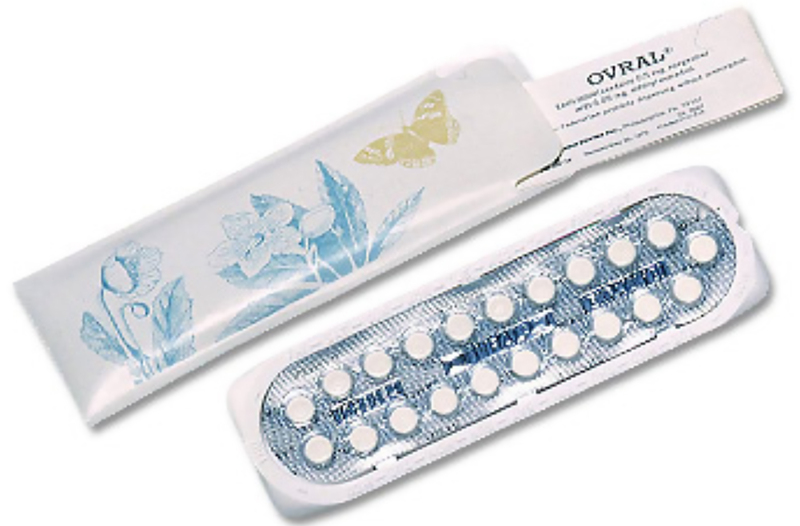 Some oral contraceptives have been dispensed on small squares of perforated filter paper designed to be torn off, chewed and swallowed. 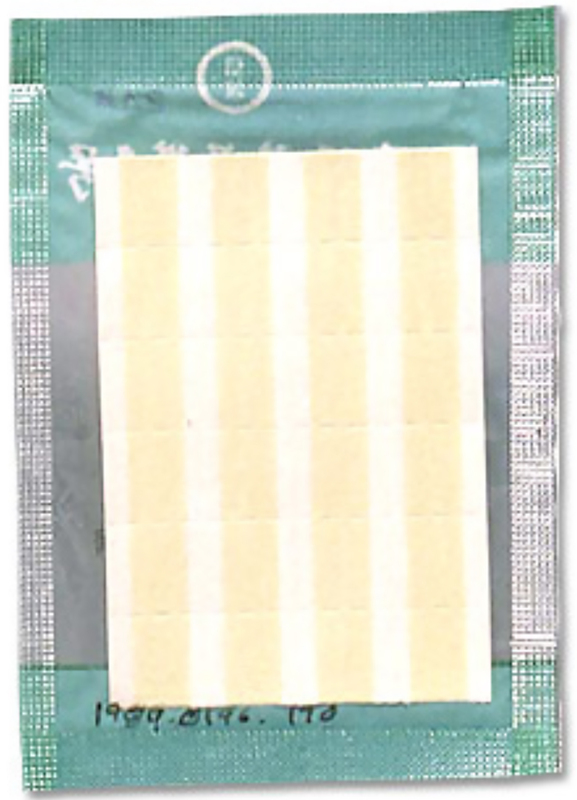 This Chinese paper pill, acquired by the Smithsonian in 1988, measures 4.0 cm x 5.8 cm. 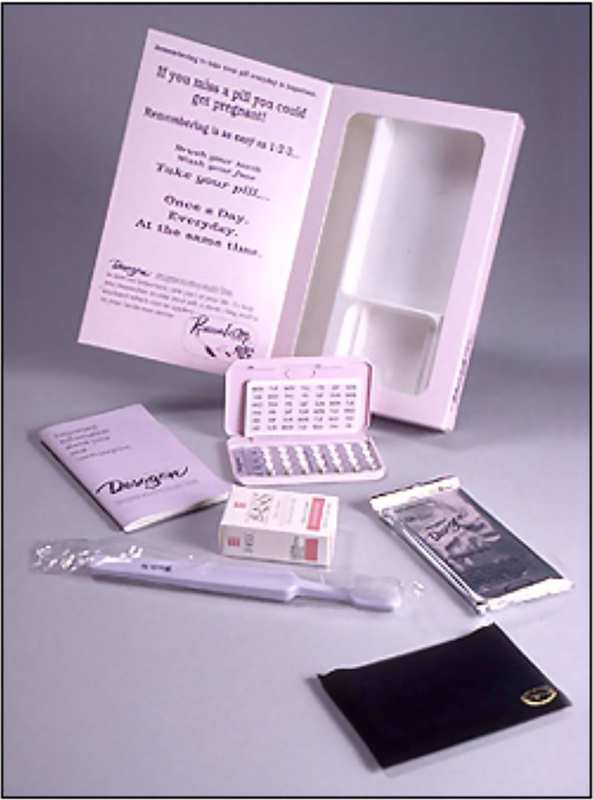 Organon, Inc., included helpful suggestions for forgetful pill-takers in the starter kit they distributed in 1993 with their Desogen oral contraceptive. The kit contained a bar of soap, a toothbrush, and a "Remember Me" sticker for the bathroom mirror with the slogan, "Wash your face, brush your teeth, take your pill, once a day, every day, at the same time." 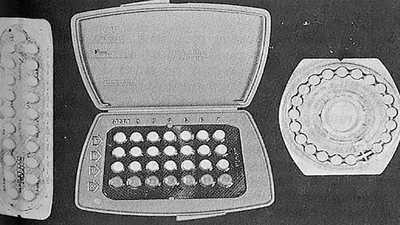 The tablets came in a calendar compact with a choice of stickers that enabled the pill-taker to start her cycle of pills any day of the week. Gregory Pincus found a way to test the contraceptive powers of progesterone and sidestep Massachusetts' rigid anti-birth control laws.